March means that tarpon season is right around the corner here on Pine Island and this article is for those of you who are new to the sport and hoping to land your first silver king with a fly rod. Here are five things I’ve learned over the past seventeen years of chasing these fish for a living that will both increase your odds and simplify the process. 1. Use a lighter fly rod. You really don't need anything heavier than a 10-weight to catch the majority of tarpon you'll encounter off Pine Island. Mid-range saltwater rods are not only easier to cast but the lighter lines hit the water with less impact. This is less likely to spook these fish, especially given our calm conditions most of year. Yes, there are some true monsters that swim through Charlotte Harbor and the Gulf beaches, but concentrate on the smaller tarpon before you work your way up to the 12-weight fish. 2. Use a heavier leader. If you’re not trying to set a world record then there's no reason to use anything less than 20# test for your class tippet. In fact, I know several guides who simply use a single, nine foot long piece of 30# fluorocarbon as their entire leader. This eliminates any knots and it's invisible in the water. It's also more than strong enough to let you muscle a mid-size tarpon to the boat quickly. That's important since a long battle, especially in the hot summertime water, is a sure way to kill these fish. Get them in fast and they’re less likely to become shark food after you release them. 3. Use a lighter shock leader. The straight 30# leader idea is great but I still like to tie in 18” of 40# fluorocarbon as a shock leader. Even small tarpon have a mouth that feels like a cinder block so something a little heavier at the hook stops them from rubbing through the leader. In the spring and early summer, when the seriously big fish are around I'll bump it up to 60# fluorocarbon. In fifteen years I've only had a handful of tarpon wear through that size shock leader. Use anything heavier and the fish is more likely to see it and less likely to eat the fly. 4. Use sharper hooks. It's hard to find tarpon flies these days that are not tied on pre-sharpened, cutting edged hooks. If you’re tying your own flies then spend the extra money and get the best hooks possible. My favorites are the SSW style Owner Cutting Point in size 2/0. They're wickedly sharp and penetrate the tarpon's mouth better than anything else I’ve seen. They also have a small barb that holds beautifully but is still easily removed from the fish. A package of eight costs around $5 but they're well worth it. 5. Use your drag. This is the most important thing of all. When I was guiding down in Key West my buddies and I had a rule that three jumps from a tarpon counted as a caught fish. After the third jump, getting it up to the boat was just a formality. Everyone should consider this rule since it’s easier on both the fish and the angler. As a beginner I lost way too many tarpon because I babied them during the fight. I'd give them too much slack and barely pull on them for fear of breaking the light tippets I used. In other words, I was so afraid of losing the fish that I'd eventually lose the fish. That changed one summer when I had a client nearly pass out from heat exhaustion while fighting a really big tarpon. He actually dropped to his knees on my deck but managed to hang on to his rod. It scared the hell out of me since I thought he was having a heart attack. While he chugged some ice water I took his rod and covertly cranked down the drag all the way down on his Tibor reel, hoping the fish would break itself off before the guy dropped dead on my bow. Instead of that happening, when my angler recovered he quickly found himself in complete control of the tarpon for the first time in over an hour. Five minutes later we had the 100 pounder next to the boat and both angler and fish survived the ordeal. In other words, start off with a light drag but right after that third jump is the time to really beat on them. You’re not going to keep any tarpon so don’t be afraid of losing one. Good luck out there and hope this helps. My buddy Paul Murray from the east coast of Florida sent me a couple of excellent shots of his Release Classic 15 on the water. 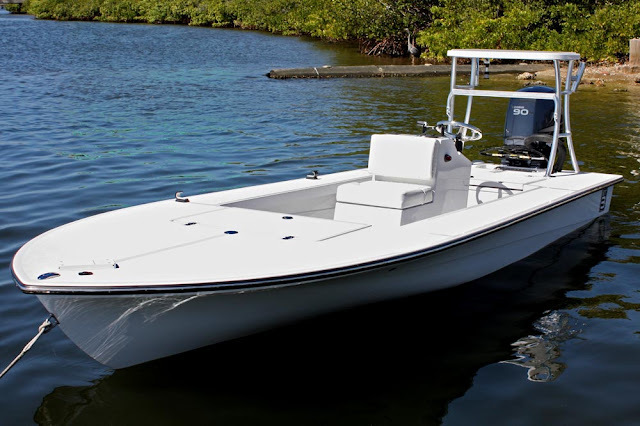 This is a great looking, old school microskiff built in Homestead. Paul has been running the boat for almost two years now and has racked up some impressive catches on it. I love small skiffs like this and if I wasn't guiding I would own one in a heartbeat. North Carolina angler Russell Kitchens was back at it again today and landed this 29 inch snook and a few others with me in Pine Island Sound. They're coming out of the woodwork for me lately. No complaints about that, but I would like to eat one this fall. Actually, they never went away. Mike Craig from Bokeelia hooks up on a mid-size snook. Voracious eaters once the waters warm up out there. Pine Island Sound is loaded with guys like this. Mike's buddy Russell from North Carolina got the prize for best fish of the day. A beautiful 33 incher. Topwater lures are my weapon of choice for snook fishing. Big trout were also in abundance today. This 20 incher hit a Gulp near Pineland. My buddy Capt. Mike Bartlett down in Key West is selling his 2011 Beavertail BT3. This boat is the first BT3 built by Aeon Marine and is rigged with a Yamaha F90 outboard with just over 800 hours. The skiff has lots of additional features that also make it a perfect tarpon fishing rig including remote controlled Minn Kota trim tab mounted trolling motors. This BT3 is in excellent condition and does not come with a trailer. Right now this is the only used BT3 on the market and the asking price is $25,000 firm. This is almost $10,000 less than a similarly rigged new model so please don't bother him with lower offers. You can e-mail him for more details at captainmike@keywestflats.net. I woke up on Monday morning to find my SUV's windshield covered in frost. Bad news. The water temp at the boat ramp was 52 degrees at 8AM, a 20 degree drop in 48 hours. Even worse news. So yes, the fishing has been more then tough the last two days. But the good new is that things are warming up quickly and I found water in the mid-60's again this afternoon. My anglers also found a few willing fish, including the 21 inch trout in the photo above, but we had to work for it. We've got great tides this week so things will get back to normal quickly. From what I heard from my friends who were there, this year's Miami show was a big success and the Aeon/Beavertail display was swamped all four days. That doesn't surprise me at all, it was the same story two weeks ago at the Ft. Myers Sportsman Expo. Their new 17' Strike is the best technical skiff on the market right now and the orders are pouring in at the Palmetto factory. The next Aeon/Beavertail Demo Day will happen later next month in Naples so stay tuned. Key West's Capt. Mike Bartlett running his skiff to the Marquesas. Driving a flats boat while you're sitting down might be comfortable, especially in choppy water, but it's not a good idea. When I first started fishing down in the Keys a veteran guide advised me to always stand up while I was running the boat so I could what I was about to hit. Even though I followed his advise religiously, over the next ten years I still managed to snag dozens of crab traps, smash into a submerged Cuban raft, and wreck a prop and lower unit thanks to a piece of rebar shoved into the bottom. Driving my boat from a seated position would have made things even worse. There are lots of hazards out there on the flats, especially here in the darker waters surrounding Pine Island, from slow moving manatees to non moving oyster bars. Despite all that, I'm amazed at how many guys I see out there running full throttle sitting behing the wheel with a passenger direcly in front of them. Stand up and keep your eyes at least two boat lengths ahead at all times. As an added bonus, you'll be amazed at how many fish you can spot and come back to later. And wear your kill switch, too. More on that later. I got chased off the water by the rain today but here's a cool shot from last weekend. Dave Stiffler from Burnt Store came down to fish with me and nailed this pair of jack crevalles on a single Bomber Mullet. I've seen this happen a couple of times before and it's always a hilarious sight. Jacks are some of the most aggressive fish in the ocean and when they're schooled up will hit anything that moves. If they grew as big as tarpon I wouldn't go near the water. Here's your chance to own one of the best skinny water fishing machines ever built. This 2006 Beavertail B2 is in factory new condition with an immaculate, garage kept hull. The engine is a 2-stroke Yamaha 50 with only 256 hours, one of the lightest and most reliable outboards ever made. The boat also comes with a jack plate, trim tabs, Yeti Cooler, bow mounted casting deck, a Blue Rock trailer, and several other features. 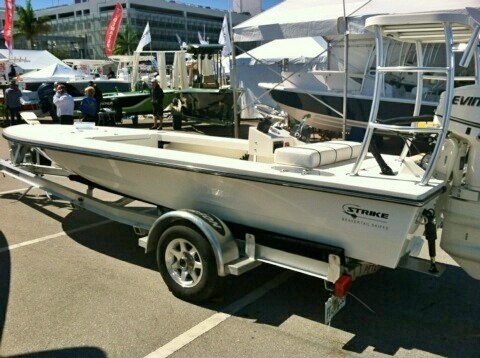 This is a great skiff for both a guide or recreational angler. I ran charters from an identical rig for more than four years and loved it. It drafted just over six inches and had a top speed of over 30mph while sipping gas. This B2's owner has just ordered an all new Beavertail and the boat is currently located at the factory in Palmetto. If you'd like more information want to schedule a test ride call Elizabeth at 941-705-2090. February in Southwest Florida means great weather and great fishing. If you’re sitting anywhere on Pine Island right now while you’re reading this, put your laptop down for a second and pat yourself on the back. Seriously, go ahead and do it. I’ll wait. That’s great. You needed to congratulate yourself for being in one of the best places in Florida to go flats fishing this month. The shallow waters surrounding Matlacha and Pine Island are more alive with game fish right now than almost anywhere else in the state. Here are just a few examples from the last couple of days. Cal Tinkey with a 28 inch snook caught at high tide near Jug Creek. A slob of a trout for me on my day off this week. Bob Gertner with one of the better trout he caught with me in Pine Island Sound. Sending another big snook home. This one was caught in Buzzard's Bay. Our snook population is in great shape right now.